"The recipe for this easy salad came from my grandma, who made it in the summers with fresh dill and cucumbers from her garden." This was such a fabulous, light summer salad! 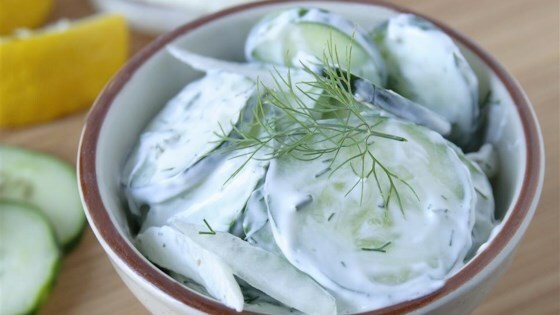 The onion and dill taste great and complement the cucumber. I'll be making this again soon. So yummy and very refreshing! It was very easy to make and a nice change from the typical summer salads (macaroni, pasta, potato.) 3 cucumbers made a lot, so next time I am going to use 2.